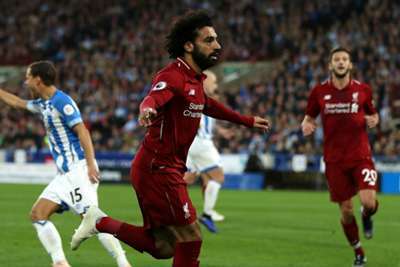 Mohamed Salah's first goal in five club appearances ended Liverpool's four-match winless run in a valuable 1-0 victory at lowly Huddersfield Town on Saturday. While David Wagner's men are sinking deeper into danger, close friend Klopp can be satisfied with a professional performance secured without several first-team regulars. Robbed of the injured Sadio Mane and with Roberto Firmino on the bench, Liverpool's possession lacked a threatening edge until the 24th minute. Jonathan Hogg soon rattled the left post with a sweet half-volley before unsuccessful penalty appeals for handball and a disallowed finish from an offside Alex Pritchard heightened Huddersfield's sense of injustice. Christopher Schindler's brief lapse in letting Salah find space for the winner proved costly in a match of fine margins. - Liverpool have become just the fourth Premier League side to win 200 Premier League games away from home after Manchester United, Chelsea and Arsenal. - Huddersfield have managed just two shots on target across their three Premier League games against Liverpool. - The Terriers have failed to score in their last seven home Premier League games since Tom Ince netted in a 1-0 victory for the Terriers against Watford back in April – only Manchester City (8 in 2006-07) have ever had a longer such run in the competition. - Liverpool's Alisson has kept six clean sheets in his opening nine Premier League starts – the only goalkeeper to have kept more shutouts in his opening nine starts in the competition is Petr Cech (7).